April 2016 – When company founder John Malish hired Wanna Gunnoe in 1966, he had no idea that 50 years later, Mr. Gunnoe would be celebrating 50 years of service with the company. Yet, that is exactly what happened and Mr. Gunnoe continues to report to work every day for Malish and will do so for the foreseeable future. After following his brother north to Cleveland from their native West Virginia, Mr. Gunnoe found work at the same company that hired his brother. 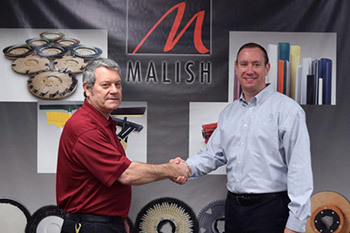 Malish Brush & Specialty Company was a fledgling manufacturer that was growing rapidly and constantly on the lookout for good employees that could help them grow. Mr. Malish would shortly discover that Mr. Gunnoe met that standard. Wanna Gunnoe has worked virtually every job in the plant over his tenure. He has worked for John Malish’s son Terry, who headed Malish from 1968 until his retirement in 1998, John Malish’s grandson Jeff, who currently is President of Malish and even alongside John Malish’s great-grandson, Jon Malish (Jeff’s son). Mr. Gunnoe’s history with the company closely tracks the company’s growth over the years, including the name change to The Malish Corporation, the move to Willoughby, Ohio, from its downtown Cleveland location, and its expansion into plastics extrusion and sales and manufacturing facilities on three continents. Today, Mr. Gunnoe works in the engineering department where he helps to produce prototypes and is involved in quoting new products.